Lots to see in the desert! Las Vegas, Nevada is certainly well-known for the casinos, glitzy nightlife, excessive wants and expensive lifestyle. Did you know that Las Vegas means “the meadows” in Spanish? It was named this by explorers who found the springs and meadows surrounding the area. Not too far off the famous Strip are quiet parks, nature preserves and neighborhoods. Justin and I decided we needed some quiet spaces and time together in nature so we got in our rental car and headed off to explore. Our first stop was the Clark County Wetlands Park. 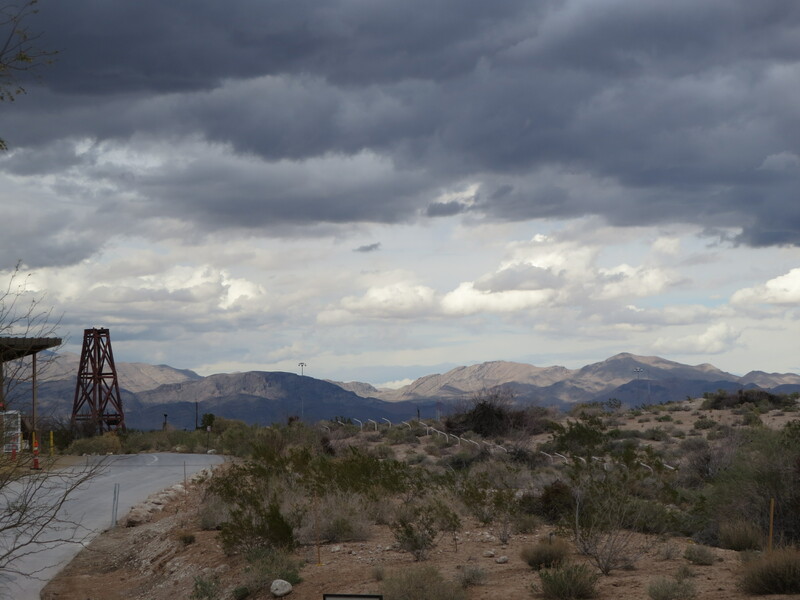 The park includes 2,900 acres along the Las Vegas Wash. This waterway is considered an “urban river” comprised of water from urban runoff, shallow groundwater, reclaimed water, and storm water. An exhibit sign describes wetlands “as “kidneys” of the environment, cleaning the water that runs through them, filtering out harmful residues from fertilizers, oils, and other harmful contaminants” found on roadways and in surrounding areas. The Wetlands Park nature preserve is 210 acres with a 112 acre mitigation pond that is home to much native wildlife and migratory birds. A nature center welcomes visitors to the area. The building is LEED certified and is a beautiful, energy-efficient area. An auditorium shows an orientation film for the Wetlands Park, highlighting various areas of the land. The nature center gallery area contains interactive exhibits, dioramas with life-size wildlife and vegetation exhibits, a model of the surrounding land, and a gift shop. 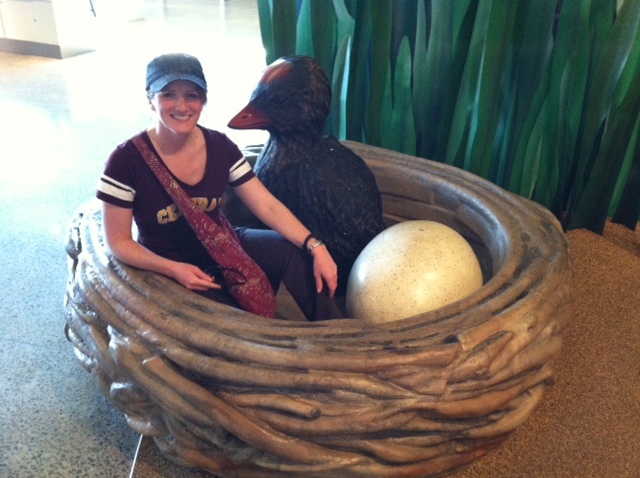 Justin and I both enjoyed exploring the nature center and stayed busy with the interactive exhibits. I highly recommend checking out the nature center and film before heading outside to the trails. and how easy it is to take it for granted until you are scrambling to revive it. And you want to be smart when walking through any park or trail system – bring water, hat, sunglasses and sunscreen (and use all of them!). I liked that there were many hiking trails where bikes weren’t allowed so you could enjoy a quiet, relaxing walk. We also found some geocaches while wandering through this nature preserve. We encountered two women looking for the same cache so enjoyed a conversation about interesting finds. Our adventures next took us to the Springs Preserve, off of Valley View Blvd near US95. 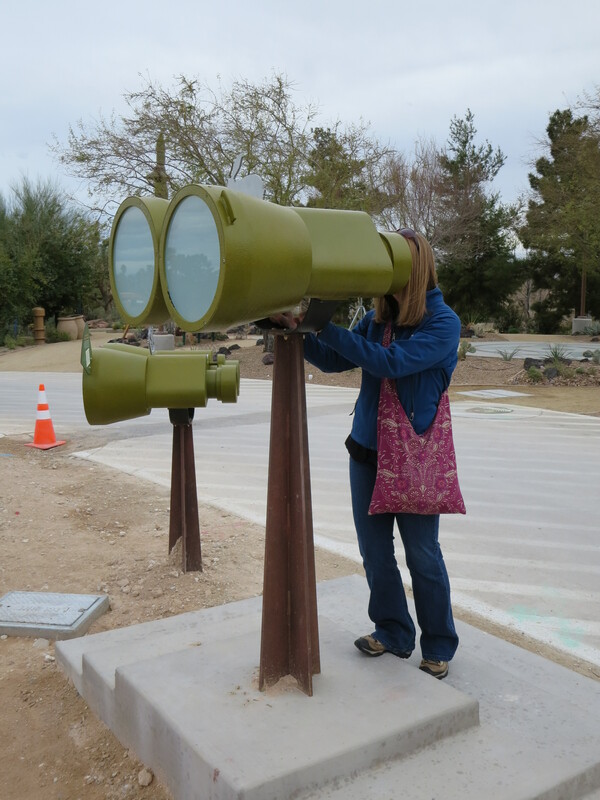 The 180-acre preserve offers much for visitors to enjoy – museums, botanical gardens and interpretive trails through wetlands and desert lands. You can very easily forget that the hustle and bustle of the casinos and restaurants is not too far away. Many events and classes are held here, and special events such as weddings can be hosted in the gardens or building. The botanical gardens boast 110 acres of gardens and wildlife habitats, including the largest collection of Mojave Desert cacti. I loved wandering through the gardens; the grounds are well-designed and laid out for an enjoyable visit and, even in the desert’s winter, the gardens looked beautiful. If we lived closer I would definitely purchase a membership and take advantage of some of the classes offered – how to grow tomatoes in the desert, picking the right soil for planting, attracting wildlife to your gardens and more. There is a big children’s area that welcomes families to play and explore. The Sustainability Gallery lets visitors discover an eco-friendly lifestyle by wandering through a sustainable house, learning about compost and alternative energy, and testing your knowledge on water conservation and recycling through interactive video games. The exhibit designers did a great job of presenting the information in a fun, interactive, easy to understand way. In the middle of the gardens is DesertSol, the award-winning sustainable living home model built by UNLV students (it won a national competition and took second place in a global competition). This 743-square feet home demonstrates how to use solar energy as the only fuel source and how to live simply and eco-friendly (in a very cool looking house). Also on the property is the Origen Museum, which has many exhibits detailing life in the desert. An exhibit on Leonardo di Vinci: Machines on Motion, on display until May 4, shows blueprints and designs from the famous inventor. The Nevada State Museum also sits on the Spring Preserve’s property. It shares the history of the area, from the westward migration for settlements to the first casinos to the area’s expansion. There are almost four miles of trails on the Springs Preserve property that meander through desert plants and historical settings. There is little coverage from the sun though, so bring sunscreen, a hat, water and sunglasses (this should be common hiking essentials in the desert!). For those who want to see the area but not walk, a train travels along the exterior trail (about 20 minutes). Biking is also allowed on these trails. As you’ve hopefully realized, there is much to see and do surrounding the Las Vegas Strip. It is an area rich with history and full of fascinating wildlife, plants and resources. The trick for these desert communities is to ensure these resources are well taken care of for many generations to come. Although that is the trick for all of our communities, isn’t it?